Atlanta has added a lot of new condominiums in the last few years, and we're not slowing down. Cranes can be seen from downtown to Buckhead as new towers go up offering more high-rise living options than ever. These new Atlanta condos for sale have all been built since 2017, so if you're looking for the newest place to live check these out first. If you know which area you'd like to be in you can narrow it down to new condos in Buckhead, Midtown or Downtown too. Why work with us to buy a new Atlanta Condo? Remember that the people at the sales center work for the developer and have a fiduciary duty to look out for their best interests - not yours. By working with us we can represent you and help guide you through the process while making sure all your bases are covered. We also know about builder specials that they may not tell you about in the sales office. And the best part is our services are free to you! 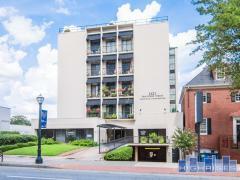 So call us today at 404-491-7770 and let's start touring these newer Atlanta condo buildings.